From the double-horizontal, 1983 and 1985, on Saturday 13 September 2008 at the home of jfacciol in Brooklyn. Dow 85 decanted at 10:45pm on Friday, Graham's 83 decanted at 11:45am Saturday. G85 and NN85 decanted shortly after 11am Saturday. 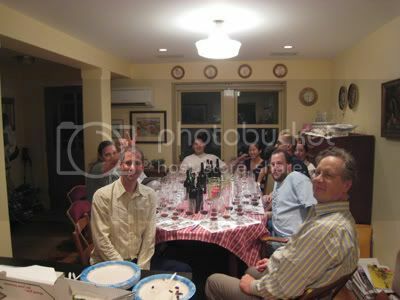 Jay hosted yet another fantastic evening. Photographs and commentary tomorrow. The bottles, as photographed late in the evening. In all five houses I preferred the ’85. Most males present agreed, with scores averaging 4-1. (The ladies preferred the ’83s.) 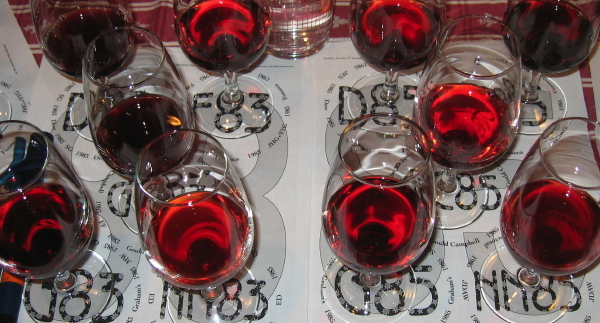 In all five houses ’85 had better fruit than ’83, and the spirit was more overt in the ’83. It is always fabulous to see one’s prejudices reaffirmed. Hurray! This seems to have been a fun evening. Any chance someone can put names to faces, pease? Left-to-right: Molly E. B.; Subir G.; Dave C. = differentdave; Jay = jfaciol; EricD. ; Michael W. = TBird. Off to the viewer’s left are Stephanie and Jeff Ghi, and yours truly is behind the camera. Interesting to see the depth of colour of the Dow and GC 83s. These seem as dark as the F85 which is normally very dark. The NNs seem very mature from a colour perspective alone. Not what one might expect from these. 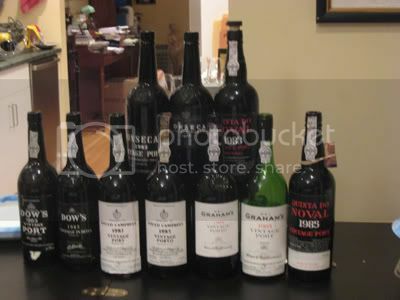 I wonder if the bottles you had are typical of these NN vintages? I don't think I have had either of these. Great pictures and great notes. Thanks. Finally got around to posting. Busy with family stuff and getting caught up with friends who work at lehman. Rough times, especially with a port hangover. 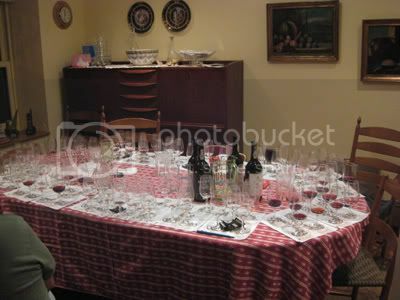 I'm trying to find my tasting notes but I'm not sure where I put them. 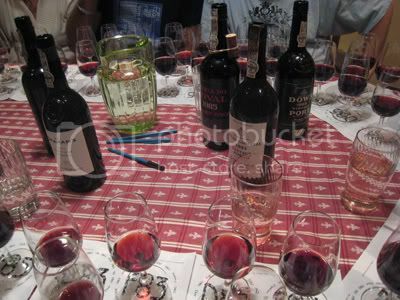 Wine of the night for drinking now was the Fonseca 83, which I believe got 4 votes for first. Fonseca 1983 as wine of the night! Very interesting considering the reputation of this wine as being a "weak" Fonseca. I'm glad you pitched it against the Grahams '83 and '85, which are wines I know and love. 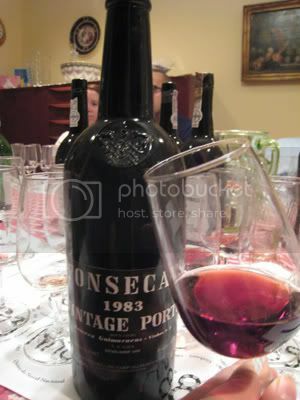 AHB wrote: Fonseca 1983 as wine of the night! Very interesting considering the reputation of this wine as being a "weak" Fonseca. I'm glad you pitched it against the Grahams '83 and '85, which are wines I know and love. me and julian both voted for the graham's 83 as wine of the night but were overruled by the majority since we were the only two votes for the Grahams. 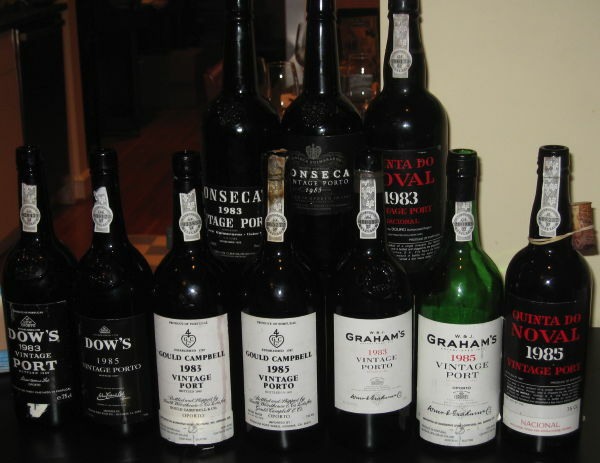 A common comment I heard about the Fonseca is the delicate balance and for the non everyday port drinking people was the least like "cough syrup". 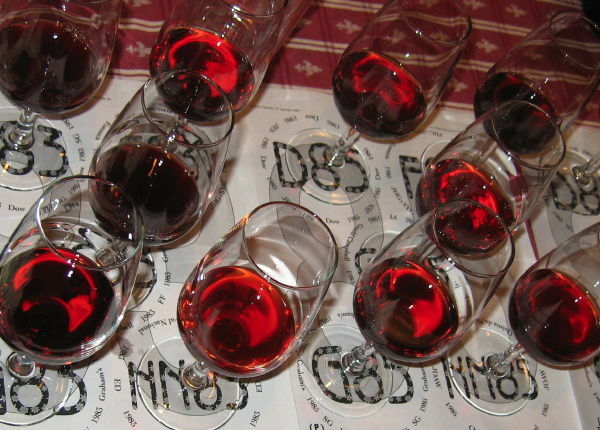 They also refer to the spiciness of the finish and talked about the lack of "dryness" that was apparent in the dows. 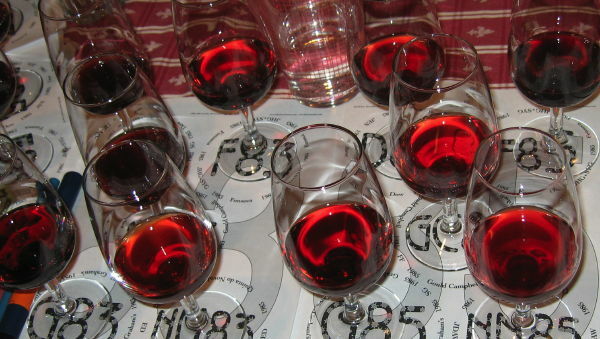 In terms of drinking in some future date, the Fonseca 85 was the clear winner. g-man wrote: me and julian both voted for the graham's 83 as wine of the night but were overruled by the majority since we were the only two votes for the Grahams. Correction: I voted, for drinking now, G85. For drinking at peak, F85. ah yes, I voted for the grahams 85 then too. 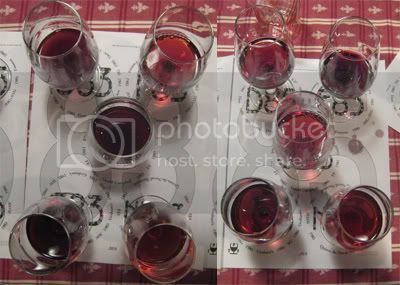 I'll repost once I find my notes again as I've marked the wines with their total votes. my notes are missing in action too. they'll pop up. thanks for a great evening. i think i was kicked out at the end? As we prepared for another special evening. Thanks again to our host jfacciol for the lovely evening, to g-man for that excellent pork, jdaw for supplies/glass/etc, and everyone for the good company. Last edited by SushiNorth on 06:29 Sat 16 May 2009, edited 1 time in total. Well that was really a lovely evening, and I've just enjoyed writing up my chicken scratch as legitimate notes (and replaying the evening -- sans red drink). A) this "back of the pharanx (Nasopharanx was it, gman?)" thing is quite effective. 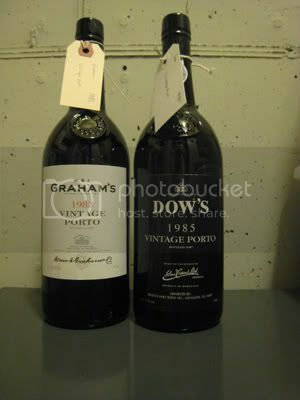 I smelled more of the port by basically inhaling through my mouth than my nose. B) the whole "cover the glass and swirl" thing works really well for me. Avoid Vesuvio 06 and 08 as E. was all up in that. 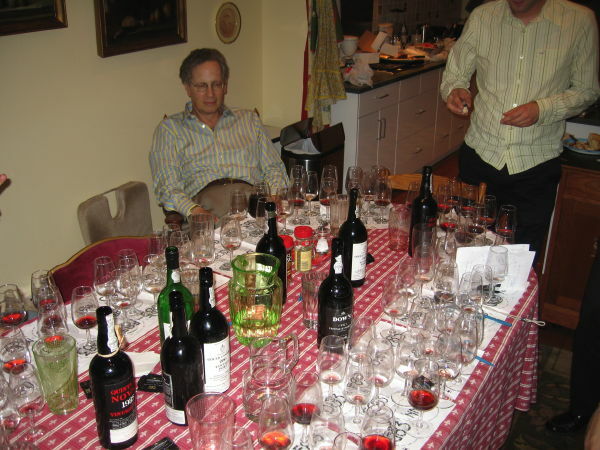 regarding big tastings: "You drink 30 or 40 things... [hanging head] and you get confused." - jdaw. Prior to 1970, who bottled it mattered. Grahams 83 and 80 need to be compared. Casual, no need for placemats. Drinkers outnumber bottles 2:1. Good food is a key part of the equation. 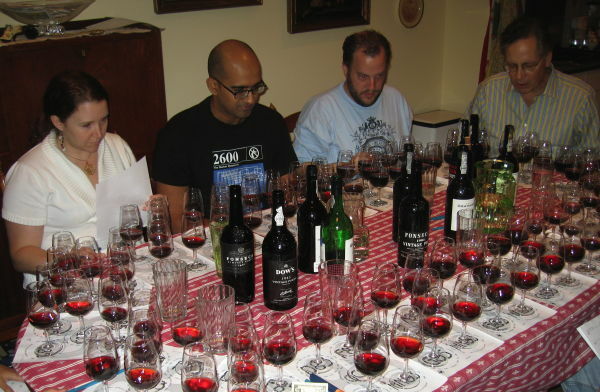 Impromptu: if we're planning it for more than a few days it might as well become a Tasting. Last edited by SushiNorth on 06:34 Sat 16 May 2009, edited 1 time in total. 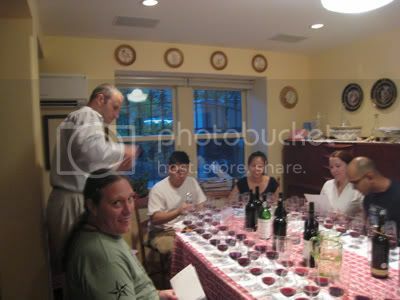 G-Man's personal ranking- I kept ranking after the initial tasting pre-food .. 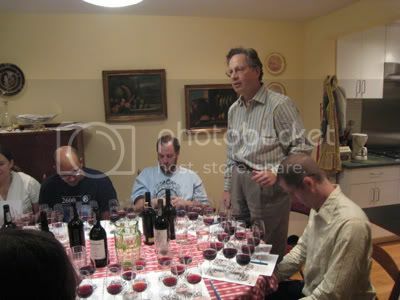 When Julian mentioned it, I realized I was suffering from palate fatigue and I believe I might have skewed the noval's higher then my initial thoughts. i finally found my notes/impressions. 1) taylor 85 - complex and young, milk chocolate cherries with cinnamon and dark berries. 2) gould campbell 83 - raspberry kirsch & dark chocolate cherries, just gorgeous. i guess in a way they now look vaguely similar but i don't recall thinking that way at the time.